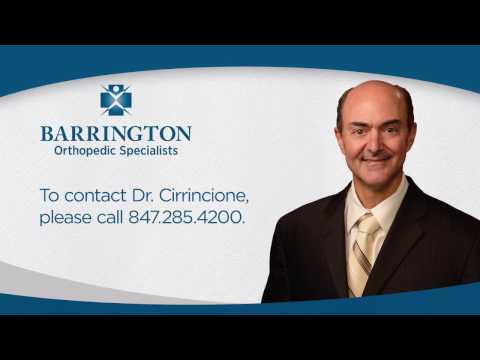 Barrington Orthopedic Specialists Providers Ciro Cirrincione, M.D. 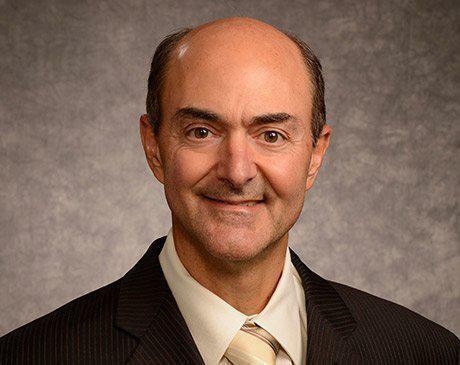 Dr. Ciro Cirrincione is an accomplished board-certified doctor and one of Barrington Orthopedic Specialists’ most senior healthcare providers, having been on staff since 1989. He has watched the practice grow to four locations, with offices in Schaumburg, Elk Grove Village, and Bartlett, Illinois. Dr. Cirrincione specializes in knee, hip, and shoulder problems, as well as joint replacement and sports medicine. After graduating from the University of Illinois at Urbana-Champaign, Dr. Cirrincione received his medical degree from the University of Illinois College of Medicine in Chicago. He then completed a combined surgery and medicine internship, followed by orthopedic residency training, both at Michael Reese Hospital in Chicago. Over a long, successful career, Dr. Cirrincione values the close relationships he has formed with countless patients who have benefited greatly from his compassionate care and medical expertise. When he’s not seeing patients, Dr. Cirrincione is usually working on his tennis serve or hitting the slopes to improve his skiing. "I felt that my MD listened to what I was saying and gave me the time I needed. I will continue to go to Barrington Orthopedic Specialists!" "Doctor Cirrincione is an excellent doctor in the care of your needs ! I have been to Dr. Cirrincione three time now and each time I have walked away feeling that I have received the best care that anyone would expect. Thank You Dr. Cirrincione and his excellent staff!" "Dr. Cirrincione is always kind and professional with his care. He explains the injury and treatment to be followed thoroughly." "I am pleased with the professional care I receive. He always answers all my questions." – Juanita K.
"I think Dr. C and the people that assist him are the very best. I have 100% confidence in him." – Chester Z. "Dr. C and his staff (Eileen and Rick) were excellent. They were very attentive and answered any questions I had regarding my total knee replacement surgeries. I would and have recommended them to family and friends." – Susan D.
"I was happy to find out there were no broken bones. Dr C. sent me to therapy and I was extremely pleased with the therapy I received. I have had therapy in the past for a knee replacement as well as a hip replacement and know about very good therapists. I received excellent treatment at Barrington Orthopedic Specialists. Thank you very much" – Carolyn B. "I had my right knee surgery done over a year ago and it has healed very well and feels great. I am thinking of getting the left knee surgery also done. I will definitely go back to Dr. Cirrincione. He is a busy man, but has earned my confidence in his skills." - Amir B. "Been having trouble with my knees...tore my ACL, arthritis on both knees. Dr. Cirrincione took excellent care of me. Thank you!" "Dr. Ciro Cirrincione was recommended by my family physician, Dr. Scott Meyer, due to a hip injury 2 years ago. On my first visit, I found him to be a no-nonsense doctor. He addressed the problem and I had a 2 week appointment for surgery. Pain-free only slight discomfort I was walking the late afternoon after. The next morning I started physical therapy. His assistant checked in on me daily. On the 3rd day I was released to go home with all the support I would need. The doctors, nurses and all staff exceeded my expectations. He is a great surgeon and will never leave you in pain. His staff is very friendly and helpful. I'm very thankful I am able to walk correctly again and to my surprise, it truly feels like my own hip. Plaudits to him and his staff. I am so thankful that my doctor recommended him." "Dr. Cirrincione has been my doctor for 20 years and has performed two successful surgeries and repaired one performed by someone else. If it weren't for him, I would still be walking with a cane instead of being able to wear high heeled shoes. As far as I'm concerned, he is the best!" "I love my new hips! Since having my hips replaced in January 2014 and March 2014, I have been able to do anything I want. My family and I have gone on numerous distance bike rides. I've gone skiing, snowshoeing, endless hikes, and for the first time in my life, I've actually got a decent kick when I swim. Thanks to my Physical Therapists at Barrington Orthopedics, they taught me how to maintain my body so that I have the freedom to participate in activities that I enjoy. I'm now able to keep up with my young children in a way that I wasn't quite capable of before my hip replacements. Thank you to everyone at Barrington Orthopedic Specialists!" "Surgery was about 13 years ago for my rotator cuff. That particular arm and shoulder has felt great ever since. I'm finishing therapy and I believe it's because of Dr. Cirrincione, along with my therapist, Paul, from Roselle with his persistence. I'm 64 now and complaining every now and then of my shoulder, but it just so happened to be the one I did not have surgery on. The therapy was forgotten long ago. Thanks doc and thanks Paul. Not looking forward to seeing you both soon!" "Doc Cirrincione is the greatest! My leg is healing wonderfully. After an intake session at Barrington Orthopedics last week, I had my first therapy session with Beth today. She commented on how well I am doing. Beth is also a wonderful therapist. I have heard some real horror stories from friends who had similar surgeries elsewhere; therefore, I have been regularly recommending Dr. Cirrincione every time I have the chance." "Straight forward approach to deal with pain. Take step one before doing anything drastic. I like it and feel confident that there will be a good outcome." "I have been treated by Dr. Cirrincione for over 7 years. Basically, for my knee issues. Though he suggested knee replacement as an option, and I have decided to wait on that option, due to recuperation and family help...Dr. Cirrincione respected my wishes. He continues to give me relief, when I need it, and the injections are always without pain or discomfort...thanks to his skills. I will continue to visit Dr. Cirrincione as he helps me with my medical knee issues, on my terms, not his terms." "In 2008, I was a 66-year-old man with a bad right knee. I was referred to Barrington Orthopedic Specialists for an evaluation and Dr. Cirrincione advised me that the MRI revealed a completely worn out knee. The cartilage was gone and I was bone-on-bone. I ended up having a partial knee replacement. I was hospitalized for 3 days after a successful surgery. I was back at work in 2 weeks (I have a sedentary job and my wife played chauffer) and was able to start driving my car again in 4 weeks. I underwent about 3 months of aggressive physical therapy, had a couple of follow up visits with Dr. Cirrincione and was discharged from his care. I have resumed my normal lifestyle and activities. I can't tell you how grateful I am for the wonderful job Dr. Cirrincione and the staff at Barrington Orthopedic Specialists did in taking care of me. I'm about ready to have my left knee replaced as it is also in a worn out condition and fully expect to have a similar experience this next time around. I would highly recommend Dr. Cirrincione and Barrington Orthopedic Specialists for anyone who is experiencing knee problems and/or already knows that they may need a partial or total knee replacement. You will be in good hands." "Excellent experience all around, appointments, office visits, X-rays and diagnosis by Dr. C were all done professionally, in a timely fashion, on site, thus lowering my stress levels, course of treatment was explained fully and was scheduled promptly, easy to understand handouts narrated the surgery from the 1st day to the last highlighting what to expect along with dos and don'ts, a schedule of nite time classes, taught by the hospital staff, was also provided (a must attend), office personnel even provided the forms for handicapped parking. All in all a full-service experience which I would highly recommend to future patients"
"Had a total knee replacement on my right knee. Everyone from the first office staff to his medical professionals to all of the people in the rehab office were terrific. I followed the doctors instructions and the rehab instructions to the letter and was back to unrestricted activity 1 week earlier than anticipated." "Excellent doctor. Explained diagnosis and took care of it promptly. Very short wait time. Staff friendly and professional"
"Dr. Cirrincione has been treating me for awhile, he and his assistant always make the experience great. No matter what office I go to the staff is always prompt and nice." "I could not walk or even drive for an hour before I would experience a lot of pain. Dr. Cirrincione scoped my knee and did a few repairs. It has been four and a half months and I feel no pain and workout 5 days a week. I am doing my spin classes twice a week and can not wait for warm weather to ride my bike. All the staff deserves a big thank you. My appointments were on time, which is huge. Everyone in the rehabilitation area was friendly and gave me the support and exercises to make my knee better. Even though I had surgery, it was a very pleasurable experience." "The whole experience there from the reception through the examination was an excellent experience. In and out quickly – hardly have to wait at all. Timely exam. Excellent staff and doctor." "The entire staff was very friendly and helpful. The x-ray techs were very patient and gentle during the x-ray process. I would definitely recommend them." "I've always had excellent treatment from Dr. Cirrincione and his staff." "A few years ago, after many years of being treated by Dr. Cirrincione for my knee pain, we realized I needed a knee replacement. My friends talked me into seeing a different doctor. I went through the pre-op but decided I needed to talk with Dr. Cirrincione first. I needed to ask him questions that the other doctors failed to answer. Needless to say, Dr. Cirrincione answered everything and I decided to tell him about my visit with to another doctor. I was a little scared of how he might take it and I thought he might even say, "well why don't you just go to that doctor.” He didn't. He smiled and asked if I had any other questions. I told him I really would like for him to do the surgery because I trusted him. He said, "Okay" and that was that. As he left the exam room, he touched my shoulder and smiled and said to me "Glad you came to your senses". If you know Dr. Cirrincione, you will know how funny that was. I had my surgery and everything went well. A year or so later, I had to have my other knee done to. That went well too. I hope I don't need Dr. Cirrincione again, but if I do, I will not go anywhere else. The office and staff have always been great too. Thank you very much Dr. Cirrincione." "I had a very pleasant experience! Doctor and staff were super! I can't believe how fast I am walking without a cane after having partial knee replacement surgery! Therapists and nurses who came to my home were also very professional and super! They got me moving quickly and now I am seeing the results of all this! I am very happy with this experience and would recommend Barrington Orthopedic Specialists to everyone!" "After teaching school in Schaumburg, coaching cross country, and running on my own for 32 years, my knees were worn out and painful. I came in to Barrington Orthopedics and saw Dr. Cirrincione. He suggested doing cortisone injections along with Synvisc until those therapies no longer worked. At that point, we'd be looking at knee replacement surgery. The cortisone shot immediately stopped my knee pain, and along with Synvisc injections, it allowed me a full year of running. After a year of continuing abuse, I was ready for a knee replacement. My left knee was the worse of the two. With Dr. Cirrincione's guidance, we decided on a full knee replacement. I had surgery at St. Alexius Hospital on August 15th of this year. From the very day of surgery, physical therapists have their patients up and moving. Today, two months post surgery, I'm feeling great, and moving better than I did before the surgery. The key to a good recovery is to continue one's physical therapy as long as possible. At this point, I'm still doing physical therapy 3 times a week. Thanks to Dr. Cirrincione's surgical skills and complete professionalism, I feel great." "Dr. Cirrincione did a great job from beginning to end with my rotator cuff surgery." "I have seen three doctors in this group. Dr. Schroeder did my knee replacement. Dr. Cirrincione cared for me when I broke my ankle. Dr. Yaffe cared for my daughter for a wrist fracture, which required surgery. Even though I live in Aurora, I choose Barrington Orthopedic Specialists! They are worth the drive. I've been to their offices in EGV, Bartlett, Schaumburg, and Buffalo Grove. The staff at the desk, as well as the professional staff, are very accommodating and pleasant. The environment is comfortable and clean." "I have been there several times for various issues and have always been happy with the care." ﻿﻿"The staff and physicians here are very good at what they do. I also had physical therapy and I had the same good experience with them." "Knee pain cured with a cortisone shot (after a x-ray). It was fast and effective." "Brought my mother (age 90) for knee pain. She got treated and taken care by Dr. Cirrincione in very compassionate manner. I recommended my family members and friends to this center and they are very satisfied with the service you provide." "I have been going to Dr. Cirrincione for many years and have always been very satisfied." Dr. Ciro Cirrincione is a board-certified doctor, specializing in ankle, elbow, hip, joint replacement, knee, shoulder, and sports medicine. He joined Barrington Orthopedic Specialists in 1989. Read More About Dr. Cirrincione in the News!